Her role as Norina in Don Pasquale will wrap up soprano Amanda Opuszynski’s two seasons with the Young Artists Program, which included several wonderful performances in YAP productions, and a mainstage debut as Frasquita in Seattle Opera’s fall production of Carmen. Today we speak with Amanda, who tells us about her role (she’ll perform Norina on March 31 and April 6, alternating with Lindsay Russell who sings on April 1 and 7), the most important things she learned as a Young Artist, and what’s in store for her future. 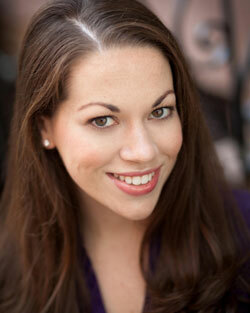 You’ve previously sung Adina in L’elisir d’amore. She and Norina sing almost the exact same entrance aria, mocking romantic fiction and letting us know you’re too clever to be a Lucia di Lammermoor. What are the differences between Adina and Norina, as you play them? The way I approach Adina is her power is intellectual. She’s very clever, very smart, but not so much aware of the power of her feminine wiles. Also, she is reading this book and thinking, “I wish this fairy tale could happen to me.” While neither Adina or Norina think the fairy tale is true, Adina wants it to happen, and Norina knows it’s never going to happen. So Adina takes her whole opera to figure out what it is she wants, and to realize the man of her dreams is right in front of her, begging for her attention, the whole time. She doesn’t realize until almost the end of the opera that she’s in love with him and that she has the power within herself to make everything happen that she wants to happen. On the other hand, Norina knows that immediately. She’s reading the book and saying, “This isn’t how it really works in the real world.” She spends all of Don Pasquale making things happen, and she’s a more active character. Things happen to Adina to make her realize how strong she is, but Norina knows that already, and just goes for it. Do we, as the audience, ever get to see who Norina really is? Norina is who she really is 100% of the time—but you see different facets of her personality shining through at different moments. She has a lot of sass and can be very matter-of-fact and nagging, but that’s who she is, and she’s not apologetic about it all. I think in the duet with Ernesto toward the end, she’s maybe at her most vulnerable, and there are glimpses of that throughout the opera in different pieces. But I think the best thing about Norina is—unless she’s playing another character, which she does for a big chunk of Don Pasquale—she’s definitely all about being who she is, and she doesn’t apologize for it. Which part of her personality do you think Ernesto is most attracted to? Their relationship is interesting because you don’t really see the two of them together; their whole love story happens before the opera takes place. But I think he loves the things about her that she shows in the aria. Her sexuality, her power, her assertiveness. I’m sure she also has a softer side that only he gets to see and maybe she doesn’t show anybody else because she has her guard up a little bit. I’ve thought about this a lot, and everything I come up with is not a scene I’m in. [Laughs] I love the duet with Pasquale and Malatesta in Act 3; I think it’s so funny. Michael Uloth (Don Pasquale), David Krohn (Dr. Malatesta on March 31 and April 6), and Joseph Lattanzi (Dr. Malatesta on April 1 and 7) do it so well, and it’s hilarious. I think the reason I love that duet so much is because it’s not something I would ever get to do. It’s a lot of patter singing, and as a soprano I never sing stuff like that, or at least I very rarely do, so I like watching and listening to it. And it’s a very funny moment, too, because Pasquale at that point is fully immersed in this scheme that Malatesta and Norina have concocted, so he has no idea what’s really going on. He’s coming up with his vengeance and the way he’s going to trap her, and he has no idea he’s the one being trapped. 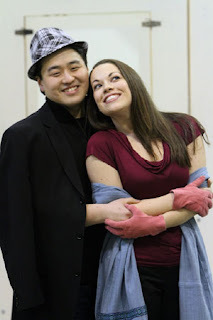 Michael Uloth (Don Pasquale) and Amanda Opuszynski (Norina) in rehearsal for Don Pasquale. I have a favorite part to perform, though, and it’s in Act 2 when Norina is paying Sofronia. It’s me playing a character playing a character, and it’s so fun to do because Norina forgets herself and shines through in different moments and then has to quickly get back into character. You’re about to wrap up your second year with the Young Artists Program. What lessons will you be taking away with you? When I started this program, I was 23 and just out of grad school. I’d sung professionally a little bit, but this was sort of the first big thing I’d done, and I came into this program still in a scholastic mentality, thinking there was always a right answer and I always had to get an A. Of course, there are no grades here, but that meant still being perfect all the time. But I learned that while you need a strong point of view in your singing, there isn’t necessarily a right answer; two different people can play the same role in different ways, and it can be equally good. You see that really well in this Don Pasquale production because almost all the roles are double-cast. When I got here two years ago, that was a concept I hadn’t quite worked out yet. I also think that, though I had a lot of really great voice teachers growing up, I really learned to sing opera here. I definitely knew how to sing before I got to Seattle, but in terms of style and the demands of singing an entire opera the way it’s meant to be sung, I think I came into my own with the Young Artists Program. Of course, YAP Director Aren Der Hacopian, Artistic Director Peter Kazaras, and Music Director Brian Garman have had a lot to do with that. And in terms of opera as a business, I guess I didn’t realize how many people can technically sing what I sing, so I had to start to figure out what makes me special and different, and what will ultimately get me a job. That became a lot clearer here. 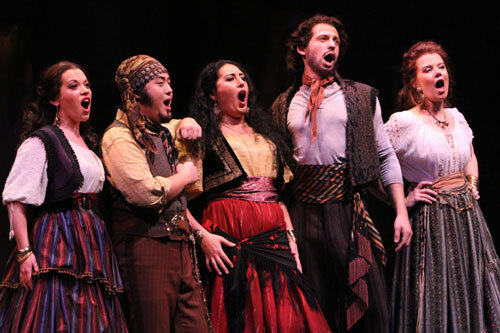 Young Artists Amanda Opuszynski (Frasquita), Andrew Stenson (Remendado), David Krohn (Dancaïre), and Sarah Larsen (Mercédès) with Anita Rachvelishvili (center, as Carmen) in Seattle Opera's October 2011 production of Carmen. This summer I’m going to the Glimmerglass Festival in Cooperstown, NY, and I’m covering Elizabeth Futral as Marian the Librarian in The Music Man. I’m really looking forward to that because I started out in musical theater and this is a weird full circle thing for me. And at Glimmerglass, they do it unamplified, with full orchestra, and mostly opera singers, so I’m really excited. Then I’m actually coming back to Seattle next summer to cover in the Ring cycle! I’m covering Woglinde and Wellgunde, two of the Rhine daughters. The Ring is such a key part of this company and it’s really cool to be involved in that in any sort of way. I never thought I would sing Wagner, but it’s great to find out there are roles I could sing. I’ve never actually done a German opera, either, so the Ring will be my first one!